A very prominent Behemoth in the collectiv imagination is surely the woolly mammoth (Mammuthus primigenius). Some authors even claim that the name derived from the Arabian word "mehemot", and passed trough the jewish "behemoth" into the bible verses of Job. The Mammoth is also a rare example of extinct animals that possess lots of generic names - the Siberian indigenous claimed it "cheli", "uukyla" or "maimant", and interpreted it as a giant rat or mole, guardian of the land of the underground or the dead. We know very much about this animal, not only by fossils or mumificated bodies found in the Siberian permafrost, but we even have the opportunity to observe ancient (10-12.000 B.C.) pictures of it, like in the cave of Rouffignac, in the district Dordogne (Central-France). Fig.1. 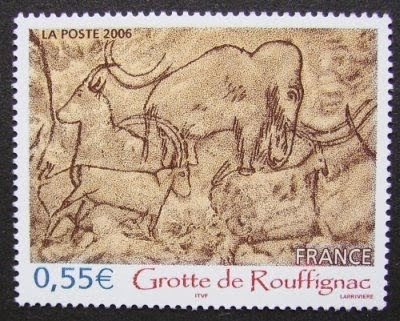 Stamp celebrating the art of the cave of Rouffignac. What´s the meaning of this art is we ignore, but we remain fascinated of the naturalistic rappresentation of the animals in display. In ancient civilisations, and later in the medieval times, the fossils of this prehistoric elephant played an important role in myths and legends of remains from giants and dragons, found in the quaternary deposits of Europe. Even the first "scientific" reconstruction of a presumed extinct animals shows, at least in part, a mammoth. In 1663 the German naturalist Otto Von Guericke tried to reconstruct the "unicornum verum", the true unicorn, from parts of various Pleistocene mammals - the teeth remarkably seems to be the big, striped molars of a mammoth, even if the skull and the rest of the skeleton is probably from a woolly rhinoceros. This historic picture is rappresented in nearly every book about history of the paleontological disciplines. Fig.2. 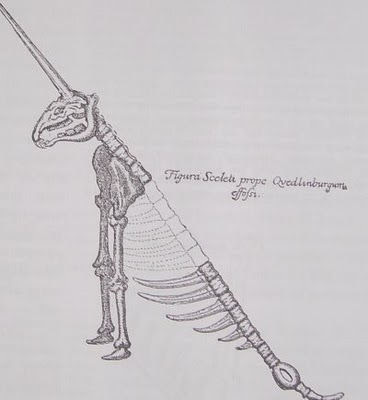 Reconstruction of the "unicornum" by Otto von Guericke (1678), and later adopted by Leibniz (1749). The true nature of these bones will be recognised in the year 1799, when the Mammoth got´s his scientific name. Today, every greater Museum for Natural History has or tries to display a Mammoth-skeleton, or at least one the typical molars of this animal, in fact, no true museum can be without a trophy of the mighty Mammoth, so the Museum for Natural History in Prague, even if it´s seem they have taken the word "trophy" much to serious. Fig.3. 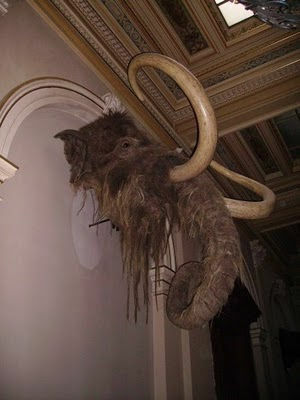 Mammoth head displayed in the museum for Natural History in Prague.